Fibroepithelial polyps are benign polypoid lesions arising from the mesodermal tissue and are one of the most common cutaneous lesions but are rare in the oral cavity and upper airway. Two cases are discussed here. A 40-year-old male presented with cough of 5-month duration associated with an intermittent foreign body sensation in the throat. Examination revealed single, smooth, pinkish, pedunculated mass hanging freely from the superior pole of the left tonsil. The patient underwent tonsillectomy and histopathological examination revealed the features of fibroepithelial polyp. A 65-year-old male chronic presented with swelling in the mouth behind the upper teeth for 2 months. Examination of the oral cavity revealed a single, nontender, firm, smooth, pedunculated, pink swelling just behind the upper incisor on the right side of hard palate; the mass was excised and found to be a fibroepithelial polyp. Fibroepithelial polyps of the oropharynx and oral cavity are rare. The diagnosis is primarily by histopathological examination of the excised mass. The key to preventing the recurrence of that lesion is its surgical excision in toto along with elimination of the source of irritation that led to the lesion. A fibroepithelial polyp is a benign lesion of mesodermal origin and is one of the most common cutaneous lesions but is rarer in the head-and-neck region. The estimated prevalence of fibroepithelial polyps is 1.2% with a male predilection. Chronic inflammatory process has been suggested in the etiology of fibroepithelial polyp. Fibroepithelial polyps may have congenital, infectious, and traumatic origins. The skin and genitourinary tract are common sites for fibroepithelial polyps. Fibroepithelial polyps in the head-and-neck region are documented in the external auditory canal, nasal cavity, oropharynx, epiglottis, hypopharynx, trachea, and bronchus., Here, we discuss two rare cases of fibroepithelial polyps of the tonsil and hard palate. A 40-year-old male presented to the Outpatient Department of the Department of Otorhinolaryngology of a tertiary care center with complaints of slowly progressive, dry, irritative cough of 5-month duration associated with an intermittent foreign body sensation in the throat. There were no symptoms of regurgitation, odynophagia, or dysphagia. General and systemic examination was grossly normal. Examination of the oral cavity was normal, while examination of the oropharynx revealed bilateral Grade 2 enlargement with a single, smooth, pinkish, pedunculated mass of size approximately 1 cm × 2 cm seen hanging freely from the superior pole of the left tonsil [Figure 1.1]. On palpation, the mass was soft in consistency and did not bleed on touch. It moved freely during swallowing and coughing, and there was no induration surrounding its attachment. Examination of the ears and nose were normal. With a differential diagnosis of tonsillar cyst or oropharyngeal benign polyp, the patient was taken up for tonsillectomy with excision of the mass under general examination. The excised mass [Figure 1.2] was sent for histopathological examination which revealed a polypoidal mass lined by stratified squamous epithelium with a fibrous stroma showing mild lymphocytic infiltration and few blood vessels [Figure 1.3]. These features were suggestive of a fibroepithelial polyp. At 1-year follow-up, the patient is asymptomatic with no signs of recurrence [Figure 1.4]. A 65-year-old male chronic smoker presented to the outpatient department with complaints of a swelling in the mouth behind the upper teeth for 2 months which was causing a disturbance during swallowing. General and systemic examination was grossly normal. Local examination of the oral cavity revealed a single, firm, smooth, pedunculated, pink swelling of size 1 cm × 1 cm just behind the upper incisor on the right side of hard palate, which was nontender and firmly attached with a narrow pedicle [Figure 2.1]. Examination of the oropharynx, ears, and nose were all normal. Fine-needle aspiration cytology examination of the mass showed a hemorrhagic smear and was nondiagnostic. The patient underwent excision of the mass [Figure 2.2], and the specimen was sent for histopathological examination which showed tissue lined by atrophic keratinized stratified squamous epithelium with subepithelial fibrous infiltrate accompanied by hyalinization with very few capillaries [Figure 2.3]. There was no evidence of malignancy. The histopathological features were suggestive of fibroepithelial polyp of the hard palate. The patient was asymptomatic at 18 months of follow up [Figure 2.4]. Etiology of fibroepithelial polyp is unknown. There are a few theories regarding the cause of these tumors. The first one is a theory of development secondary to focal losses of elastic tissue; however, there is inadequate proof to support this hypotheses. The second theory is that fibroepithelial polyp is a mixture of different tissue elements which could represent hamartoma of the lamina propria that slowly enlarge or a fibroma that exhibits the features of a benign lesion. A prevalence of malignancy in lesions clinically diagnosed as fibroepithelial polyps is extremely low. Conventionally, fibroepithelial polyps have been thought to occur after mucosal trauma. Pharyngeal polyps are rarely symptomatic, and when present, the symptoms vary according to the site of origin. Globus pharyngeus is the usual presentation. 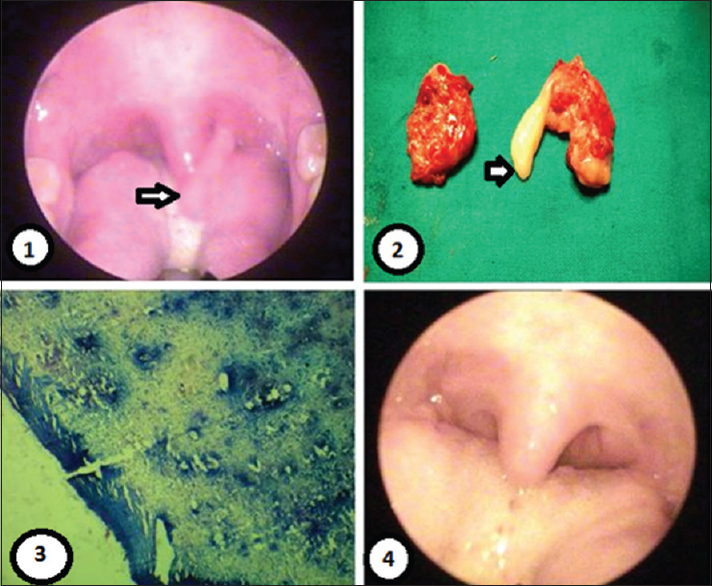 The previously reported large polyps originating in the nasopharynx or oropharynx were accompanied by choking, respiratory distress, and coughing of abnormal tissue masses. Furthermore, chronic bleeding from the polyp can occur, resulting in iron deficiency anemia. Although usually not life-threatening, fibroepithelial polyps of the pharynx may present as an acute medical emergency, causing upper airway obstruction. Management involves first securing the airway. The differential diagnosis for fibroepithelial polyp included fibroma, mucocele, giant-cell fibroma, peripheral giant cell granulomas, lymphangiomatous polyps, lymphangioma, juvenile angiofibroma, and squamous papilloma in the oral cavity including tonsil. Surgical excision is the treatment of choice. In addition to surgery, other treatment modalities are electrocautery, an neodymium-doped yttrium aluminum garnet laser, a flashlamp-pumped pulsed dye laser, cryosurgery, intralesional injection of ethanol or corticosteroids, and sodium tetradecyl sulfate sclerotherapy. However, the crucial step is to examine the tissue histopathologically to distinguish a fibroepithelial polyp from a malignant tumor since those polyps mimic the clinical features of a true fibroma. Recurrence rates are low and recurrence is mostly caused by repetitive trauma at site of the lesion. Diagnosis of an inflammatory hyperplastic lesion is quite difficult for clinicians since all lesions exhibit overlapping clinical features. Recurrence or risk of malignant transformation is extremely rare and diagnosis is primarily by histopathological examination. The key to preventing the recurrence of that lesion is its surgical excision in toto along with elimination of the source of irritation that led to the lesion. Bouquot JE, Gundlach KK. Oral exophytic lesions in 23,616 white Americans over 35 years of age. Oral Surg Oral Med Oral Pathol 1986;62:284-91. Hasegawa Y, Mita K, Ueki T, Ishida Y, Koda S, Seno Y, et al. Retroperitoneoscopic treatment of ureteral invagination caused by a long fibroepithelial polyp protruding into the bladder: Report of a case. Surg Today 2011;41:1117-21. Li M, Zhang G, Peng A, Wang C. Bronchial fibroepithelial polyp: A case report and review of the literature. Intern Med 2013;52:373-6. Tanaka N, Matsunobu T, Shiotani A. Fibroepithelial polyp of the external auditory canal: A case report and a literature review. Case Rep Otolaryngol 2013;2013:818197. Lloyd S, Lloyd J, Dhillon R. Chondroid metaplasia in a fibroepithelial polyp of the tongue. J Laryngol Otol 2001;115:681-2. Mangar W, Jiang D, Lloyd RV. Acute presentation of a fibroepithelial pharyngeal polyp. J Laryngol Otol 2004;118:727-9. Farboud A, Trinidade A, Harris M, Pfleiderer A. Fibroepithelial polyp of the tonsil: Case report of a rare, benign tonsillar lesion. J Laryngol Otol 2010;124:111-2. Patil S, Rao RS, Sharath S, Agarwal A. True fibroma of alveolar mucosa. Case Rep Dent 2014;2014:904098. Bataineh A, Al-Dwairi ZN. 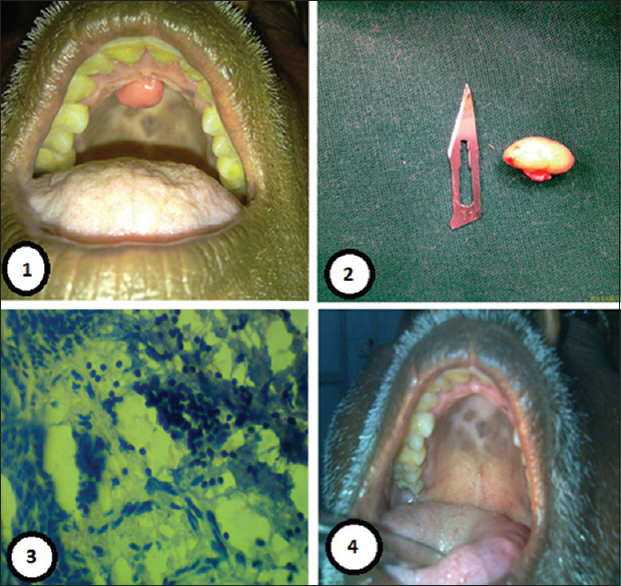 A survey of localized lesions of oral tissues: A clinicopathological study. J Contemp Dent Pract 2005;6:30-9. Halim DS, Pohchi A, Pang EE. The prevalence of fibroma in oral mucosa among patient attending USM dental clinic year 2006-2010. Indones J Dent Res 2010;1:61-6.